The water cycle includes a range of inputs, outputs and stores. 97% of all water on Earth is stored in Oceans. The remaining 3% is fresh water. 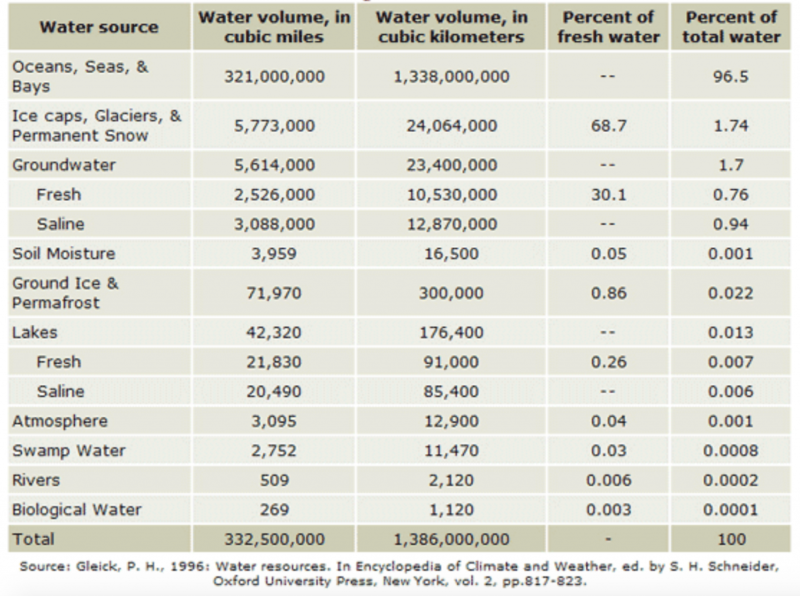 The majority of fresh water is stored in ice caps and glaciers (68.7% of all freshwater). 30.1% is stored as groundwater. Just 0.3% is stored as surface water. Most surface water is stored in lakes (87%). 11% of fresh surface water is found in swamps and 2% is found in rivers. 75% of fresh water on Earth is stored in a frozen state, part of the cryosphere. Groundwater (aquifers) accounts for 0.7% of all water and 20% of fresh water. 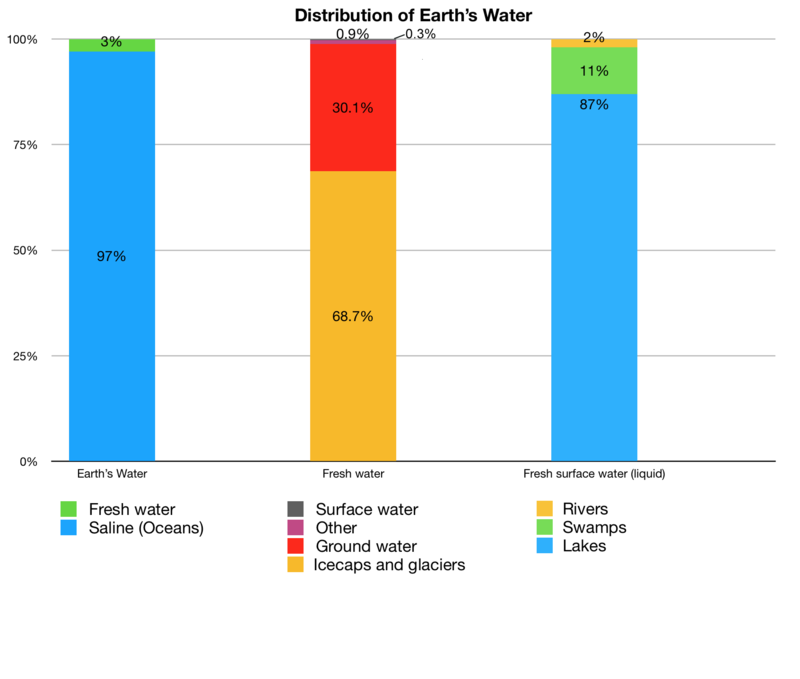 Just over 0.01% of all water on Earth is stored in lakes and rivers. The remaining water is stored in the atmosphere, in soils, flora, fauna and in humans. Over 500,000 km3 of water is in transfer between water stores due to a number of key processes. Water evaporates from surface water and from the surface of the land. Water is transpired through the leaves of plants. Together, the two process transferring water to the atmosphere are known as evapotranspiration. Condensation in the atmosphere occurs due to water vapour becoming liquid. Water can then be transferred to the surface of the Earth by precipitation. Ablation is water loss from snow or ice (e.g. through melting, evaporation or calving of icebergs). Water can also change from a solid state (ice) to water vapour. This is known as sublimation. Run-off is when water flows over the surface of the land. It usually collects in rivers and streams. These then eventually reach an ocean. Precipitation typically ends up as run-off after infiltrating and flowing through the soil. This is the transfer of water to groundwater stores (aquifers). Water from aquifers can return to the surface of the Earth as springs. Find out about the processes and pathways of the water cycle.